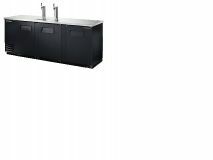 Trues direct draw beer  dispensers are designed with enduring quality and value. Our commitment to using the highest quality materials and oversized refrigeration assures colder product temperatures and years of trouble free service. Oversized, factory balanced,  refrigeration system holds 33 to 38 degrees F (.5 to 3.3 degrees C). Exterior - heavy duty, wear  resistant laminated black vinyl front and sides. Matching black aluminum back. All stainless steel counter top. Interior - Stainless steel floor  with 1/2" (13 mm) reinforced lip and heavy gauge galvanized steel walls. NSF-7 approved for packaged and bottled product. Two (2) 3" (77 mm) diameter  stainless steel insulated beer columns. Cold air is directed into beer columns to reduce foaming and maximize draft beer profits.